(Location cited as NH 947 876). 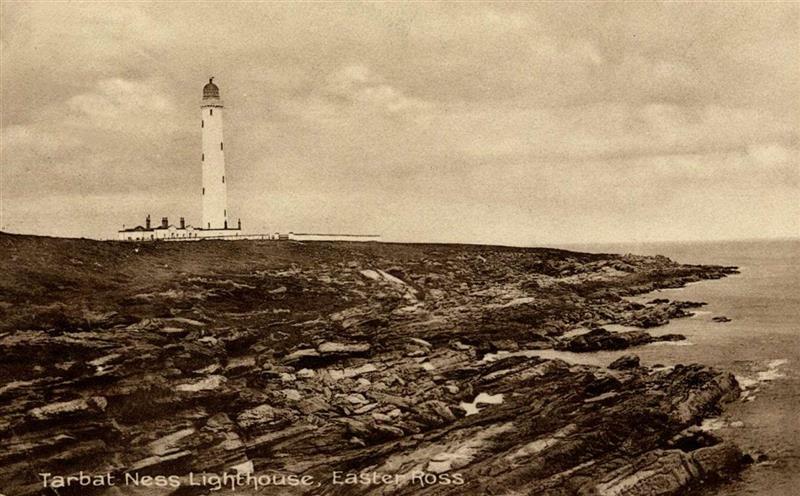 Tarbat Ness Lighthouse, built 1830 by engineer Robert Stevenson, rebuilt 1892. A tall circular tower on a semicircular one-storey base, with a triangular paned lantern with a domed roof. The corbelled parapet is machicolated. The keepers' houses are of the normal single-storey, flat-roofed variety. 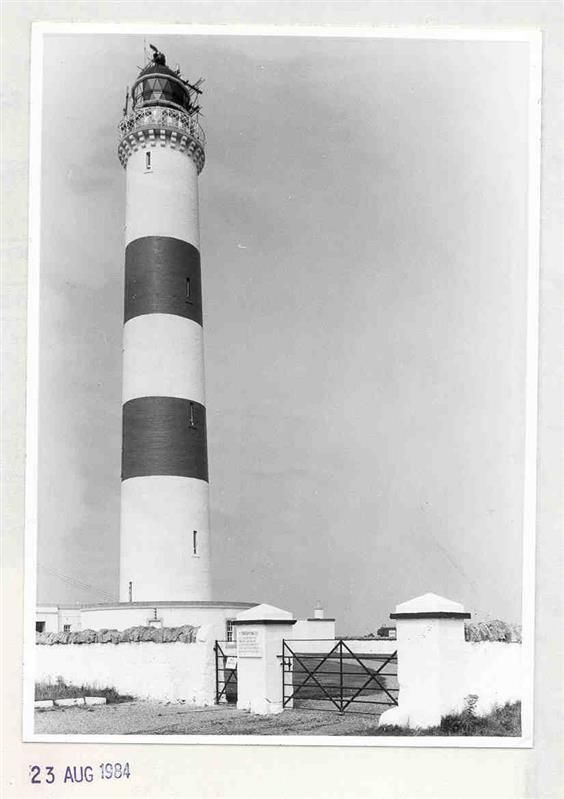 As originally built (by James Smith of Inverness) the lighthouse used obaque cylindrical shades moved in the vertical plane to display an 'intermittent' or occulting light. Earthquake shocks have been felt at the lighthouse, and the two distinguishing horizontal bands were added in 1915. Hume, J R, 1977, The industrial archaeology of Scotland 2: The Highlands and Islands, 297 (Text/Publication/Volume). SHG2332. Munro, R W, 1979, Scottish lighthouses, 83, 85, 87, 89, 105, 106, 175, 205, 255, 275; pl. p. 206 (Text/Publication/Volume). SHG2557. Admiralty list of lights, 1980, Admiralty list of lights and fog signals: volume A: British Isles and north coast of France from Dunkerque to entrance to Goulet de Brest including North Sea oil and gas production installations, 234, no. 3506 (Text/Publication/Volume). SHG1875. 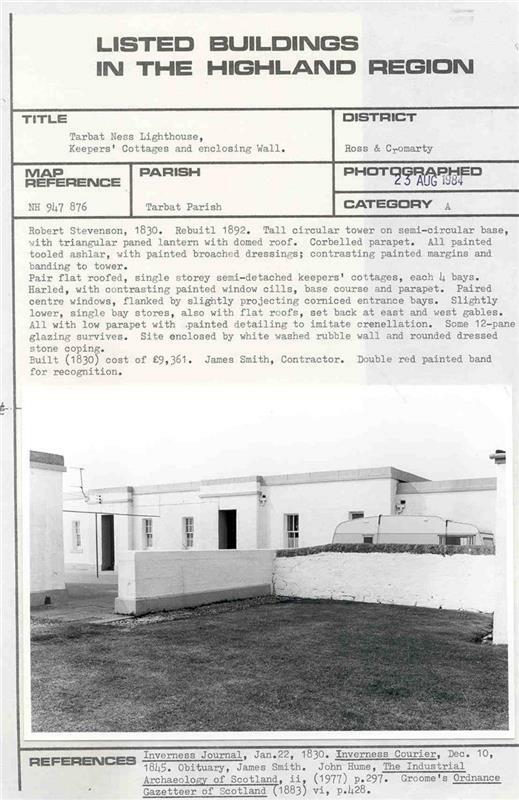 Allardyce and Hood, K and E M, 1986, At Scotland's edge: a celebration of two hundred years of the lighthouse service in Scotland and the Isle of Man, 26, 125, 154 (Text/Publication/Volume). SHG1882. --- Text/Publication/Volume: Admiralty list of lights. 1980. Admiralty list of lights and fog signals: volume A: British Isles and north coast of France from Dunkerque to entrance to Goulet de Brest including North Sea oil and gas production installations. 234, no. 3506. --- Text/Publication/Volume: Allardyce and Hood, K and E M. 1986. At Scotland's edge: a celebration of two hundred years of the lighthouse service in Scotland and the Isle of Man. 26, 125, 154. --- Text/Publication/Volume: Hume, J R. 1977. The industrial archaeology of Scotland 2: The Highlands and Islands. Paper (Original). 297. --- Text/Publication/Volume: Munro, R W. 1979. Scottish lighthouses. 83, 85, 87, 89, 105, 106, 175, 205, 255, 275; pl. p. 206.